Mark Garry is interested in how humans navigate the world and the subjectivity inherent in these navigations. While Garry employs a number of media and mechanisms in his practice, he mainly focuses on making site-specific gallery based installations. This installation comprises three essential elements, an intervention made from beads, pins and threads, a carved wood sculpture and mechanical musical mechanisms. being here combines physical, visual sensory and empathetic analogies, creating arrangements of elements that relate to the physical space and each other. Garry designed the room housing this installation. 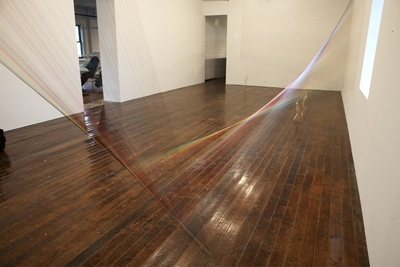 Traversing the space is a large thread intervention that moves through the room. The scale of this intervention has a direct dialogue with the geometry of this room. 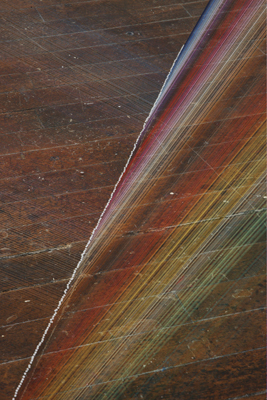 The piece is formed by hundreds of tiny threads attached to the walls and floor of the gallery with an elaborate miniature pulley system involving pins and beads. 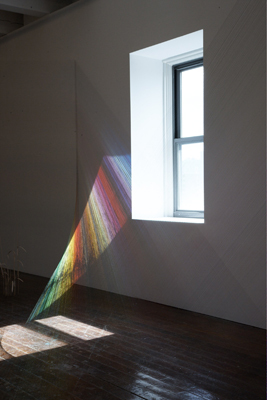 This system manifests a spectrum of color that is surprising in that it is at once monumental and barely visible. It transforms in luminescence, tone and color as one moves around it. 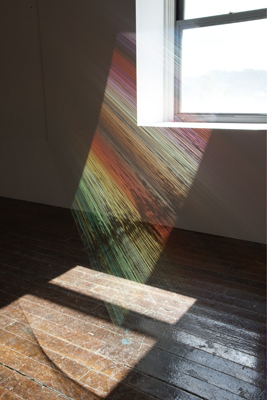 This work is also affected by the different tones of natural light entering the room, and appears to be in constant flux, changing throughout each day and each season turning from vibrant to invisible. 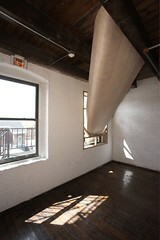 The sonic element of this installation is also informed by what is outside the room. Garry made a musical piece that is an adaptation of a drawing of the landscape that surrounds the Mattress Factory. This drawing was transferred into a range of twenty notes and further adapted on piano by Garry and Anne Angyal. 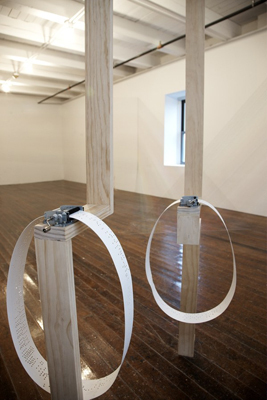 The composition was then punched out of paper and is now played on two componiums (music boxes) by visitors. The third element of this installation mirrors the levels of skill and precision observed in the other two works. Garry has made detailed, basswood carvings of grasses that he found on the road outside the Mattress Factory. 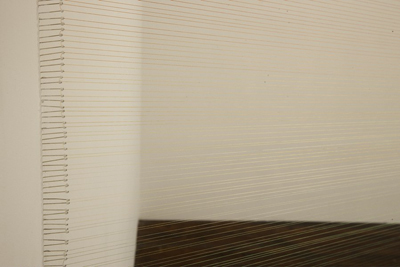 This site-specific work is quiet and beautiful, and the space is contemplative yet engaging. When encountered in nature, a rainbow is a physical and optical miracle, a rare occurrence that inspires the experience of the sublime. This work attempts to bring a similar sensation of wonder to the viewer. Part two of Tyler Green's review of Sarah Oppenheimer's 610-3356 is now posted over at Modern Art Notes. 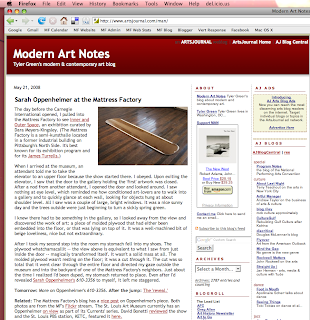 Tyler Green, of Modern Art Notes, posted some thoughts on Sarah Oppenheimer's 610-3356. Read the full-post HERE. MAN began in September, 2001. It's been hosted since January, 2003 by ArtsJournal.com. The Wall Street Journal recently called MAN "the most influential of all visual-arts blogs." Forbes magazine named MAN a "Best of the Web" site. Publications such as Slate, Contemporary, Art & Auction, Black Book, The New Criterion, and Art in America have all featured MAN. The Boston Globe said that Green "digs for news, does his research and has a 'tude." Tyler's site is awesome. And we're not just saying that because we're on it. His art-worldview is unique, honest and thoughtful. Update your readers accordingly and FaceBook'em today. Second Grade is for the Birds! 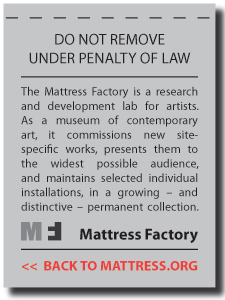 The Mattress Factory Artist/School Partnership program pairs schools with a Mattress Factory-affiliated professional artist. 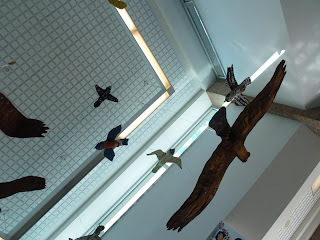 Students then work directly with that artist to create original artwork for installation in their school. In addition, Mattress Factory Education Department staff travel to the school to provide an introduction to installation art through presentations, discussion and hands-on activities. Second grade is for the birds. Through a partnership with the Mattress Factory -- a museum of contemporary installation art on Pittsburgh's North Side -- students in two Wexford Elementary classrooms are using their ornithological knowledge to create a permanent masterpiece. 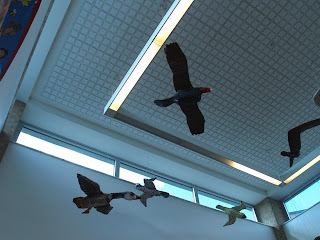 By the end of May, the school's foyer will be filled with dozens of winged creatures hatched from cardboard, plaster gauze and paint. Artist/School Partnership applications are now available for the 2008-2009 school year. The application deadline is September 1, 2008. Based on the car crash that inspired Marinetti’s revelation of the Futurist Manifesto in 1909, Luca Buvoli has created a sculptural work that depicts the 1908 Fiat in motion, the instant before the impact. 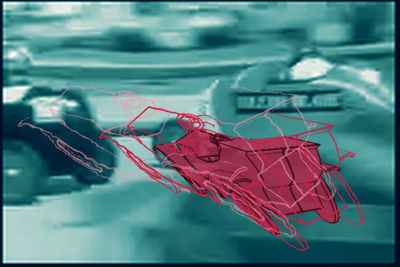 Marinetti’s famous “crash” has been the subject of various critical interpretations (some even questioning the accidental nature of the event, apparently all set up in a theatrical way). This project gave Buvoli the opportunity to explode myths of masculinity and velocity associated with Futurism. While utilizing a futuristic form for the piece, Buvoli is, at the same time, pointing out his ambivalence about the cult of heroism that has grown out of this and associated art/historical event(s). 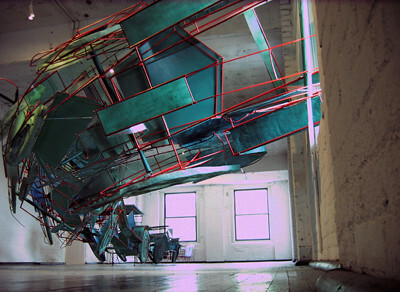 The sculpture is depicted in futuristic form; there is dynamism created by the multiple views of the same vehicle, as if captured frozen in time and motion, moving along a trajectory. This is the moment when physical, aesthetic and ideological barriers were broken. The car is breaking the speed limit of what it can maintain to hold the road. 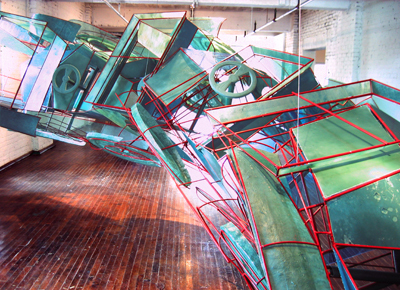 The red steel and the automobile form refer to Pittsburgh’s industrial past and pre-eminence in this material’s fabrication (around the same years of Futurism’s foundation) while the fiberglass has a more organic quality. It is translucent almost like green algae, giving the car a more “natural” skin. The car and its occupant, the artist (not represented here), have broken free of gravity and catapulted into the unknown. 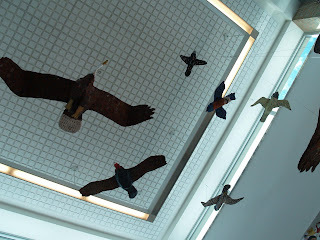 The sculpture is freed from the floor and takes flight off the floor and out the gallery window. 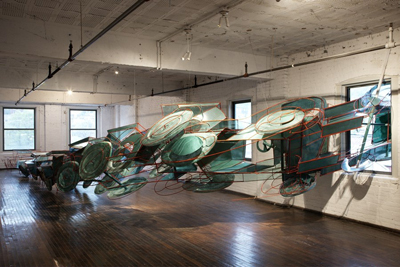 Buvoli also sees associations between the form of the work—the multiple cars—one following another and the fascination humans have with charismatic leaders. The cars follow the lead car out the window, like a flock of sheep or the blind followers of a totalitarian regime. Buvoli, who works in a variety of media, created a single-channel video for this exhibition. Ave Machina: Instant Before Incident uses what he calls a “meta-futuristic approach.” The video is an intricately edited collage of images. Using visual tricks taken from early experimental film syntax, Buvoli intercuts straight photography, superimposed hand-drawn animation, archival footage and interviews with the art historian Christine Poggi and cultural historian Jeffrey Schnapp as they discuss Futurism’s birth in relation to the desire for exhilaration, speed and projection both physical and psychological. INNER AND OUTER SPACE runs through January 11, 2009. Did you know that some of Pittsburgh best-kept -secret songwriters call Pittsburgh's North Side home? 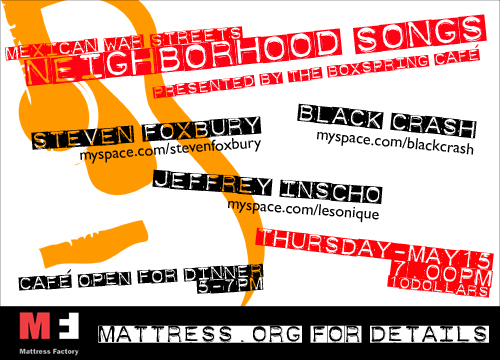 Join us on May 15 for an evening of neighborhood songs penned and performed by Mexican War Streets residents. Your new favorite song could have been written by your neighbor! Sunday's Pittsburgh Tribune-Review contained a nice review of Inner and Outer Space. The print edition showcased some great photos of works by Luca Buvoli, Allison Smith, Mark Garry and Sarah Oppenheimer. Last month, visitors to the opening reception of the exhibition "Inner Outer Space" at the Mattress Factory couldn't help but stare at the floor in a room on the fourth floor. For, cut into it was a 6-foot-wide hole. Looking down the hole, which is actually an artwork by New York City-based artist Sarah Oppenheimer, all one could see was the roof of a garage across the alley from the museum. That's because Oppenheimer had purposely directed the view to a third-floor window via a carefully crafted tunnel made of plywood that angled through the third-floor gallery below. 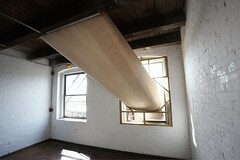 For this installation Oppenheimer created an opening in the floor of a small gallery on the fourth floor. This is the first time in the museum’s 30-year history that an artist has reconfigured the building structure in this way. 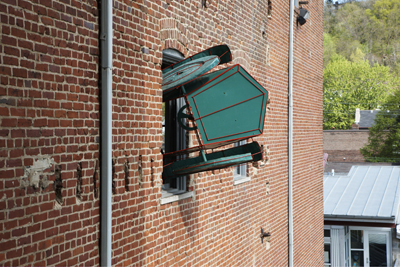 This aperture, or “wormhole,” as Oppenheimer refers to the type of hole she created, offers a new line of sight within the exhibition space and functions as both a hole and a screen directing the viewer’s gaze down and out the third floor window. The hole creates a disorienting sense of an impossible proximity between the fourth floor and the external world outside. The space of display—the museum gallery—is transformed from a container for specific objects into a lensed view of the outside world. The fourth floor gallery floor and the third floor window are part of the work. 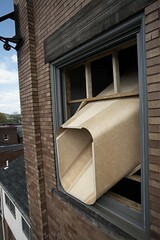 The shaped hole in the interior floor extends through the armature, framing a vista out the side of the building. In this way Oppenheimer has created a zone for pictorial reflection. The view of the outside world is framed and is accepted as the work.